No. Some people feel safer sticking with a deep-fat fryer. If you do use a wok make sure it is securely in place - flat-bottomed woks work best for electric ranges; round bottomed for gas stoves. (Make sure the round-bottomed wok is securely in place in the wok stand). It depends on the recipe, but most suggest you heat the oil to somewhere between 350 degrees and 375 degrees Fahrenheit. (Partly this depends on the size of the food being cooked, as larger items can be deep-fried at a lower temperature). Remember, though, the temperature will drop slightly when you put in the food. 4. What type of oil should I use for deep-frying? Peanut oil is good, as it has a high smoking point and thus does not burn easily even at high temperatures. Vegetable oils such as canola and corn oil are also good choices. Don't use sesame oil - it doesn't have a high enough smoking point. Neither does olive oil - besides, it's too expensive given the high quantities needed for deep-frying. Chinese recipes used to call for lard, but most don't anymore because of the fat content. You can always go the traditional route and use a wooden chopstick to check the oil - it's hot enough when bubbles form all around the object. However, it takes a bit of practice to know just when the oil reaches the right temperature. 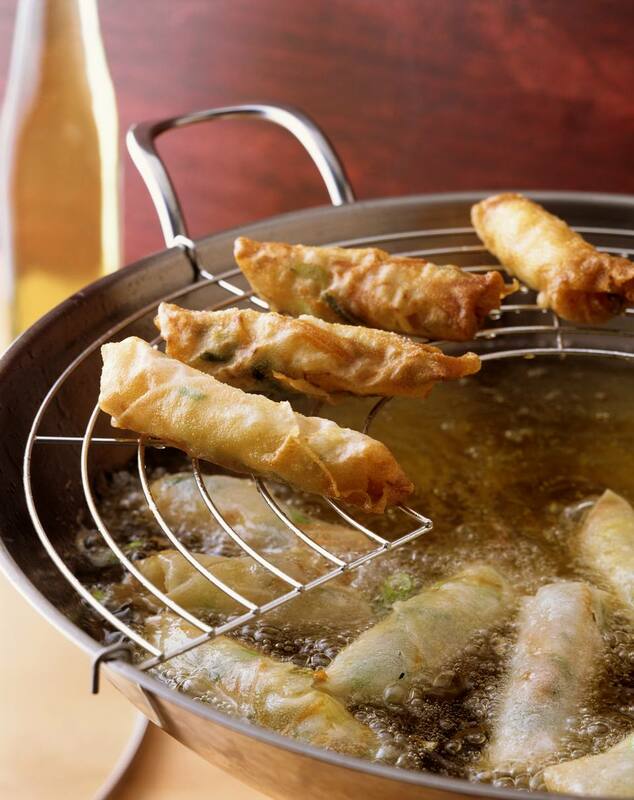 Add to that the fact that you need to adjust for a drop in temperature when placing the food in the wok, and the novice is better off relying on a deep-fry thermometer. If you don't have a deep-fry thermometer, a candy thermometer will work also. This is optional, but it does give the food a crisp coating. The difference in texture between the crisp coating and the juicy interior makes a nice contrast. Make sure to recheck the oil temperature before you add the food back into the wok. First, by keeping the temperature up. Food cooked at too low a temperature will be greasy. Secondly, by not overcrowding the wok, which lowers the temperature, again leading to greasy food. Finally, using a wok actually helps - the unique shape of the wok means that you use less oil to cook with than would be the case with a deep-fat fryer. A final word about accessories. A large Chinese wire mesh spoon (also called a "skimmer") is invaluable for moving the food to and from the wok, and maneuvering it while deep-frying. Click on the link to purchase it online.